A huge front yard is outdone in size by the even larger backyard at the home of chiropractor Dr. Kenneth Kurbs and his wife Michelle at 570 Locust St., Lockport. The property is just under two acres. 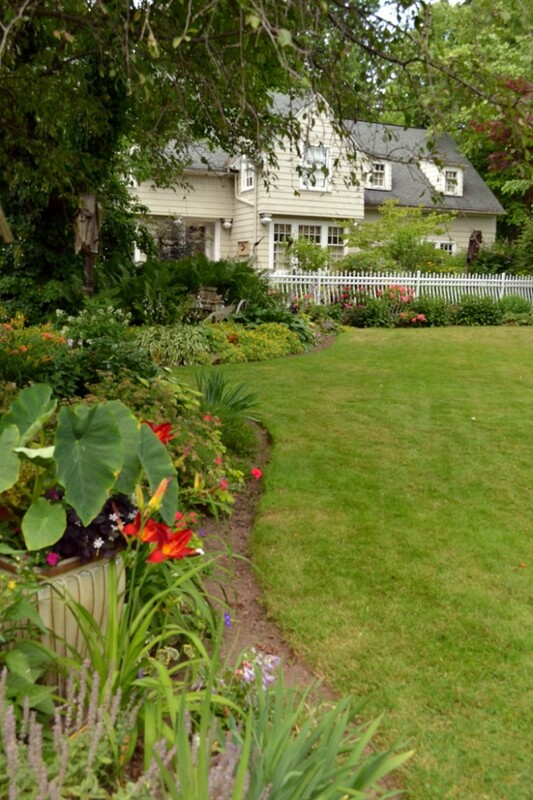 The Kurbses shared their gardens during Lockport in Bloom, the seventh annual city-wide garden tour, on Saturday and Sunday, July 9 and 10. They’ve lived there for 21 years, and he worked on the landscaping in the front of the house first. The large, colorful beds are breath taking. 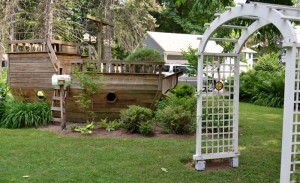 The Kurbses’ first child was born after they bought the property, and they were given a boat with the ladder and slide, which you can see below left. Kenneth knew he didn’t want to try to mow around the oddly shaped fixture, so he built the bed around it. In the foreground of the same photo, you can see a white arbor that was built by a friend’s grandfather in the early 1900s. The yard also has wide open stretches for the family’s five children to play. The children are Jordan, 19; Olivia, 16; Hannah, 14; Sarah, 12, and Michaela, 9. 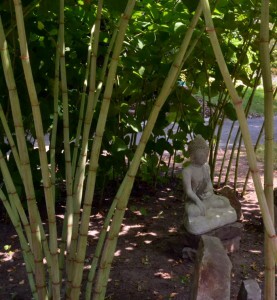 One of the areas that attracted attention during Lockport in Bloom was an Asian-inspired garden with what appeared to be bamboo, which you can see below right. That’s actually Japanese knotweed, and it’s a bad garden plant. The eight-foot tall plants do look lovely. Kenneth trimmed away the leaves at the bottom, which makes them look like bamboo. He mentioned that they get huge plumes of white flowers, which made them sound even more tempting. But beware: Japanese knotweed is horribly invasive. The only reason Kenneth has the Japanese knotweed is because it was already there when he moved in. He controls it in the area pictured by hacking at it constantly. It pushes up blacktop and moves rocks. In order to get it out of another area of the yard, they had to utilize a backhoe! He tried drying it like bamboo, but it falls apart. 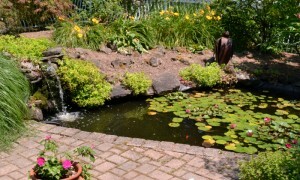 Many visitors asked about the shrub with the beautiful blue flowers, above left. 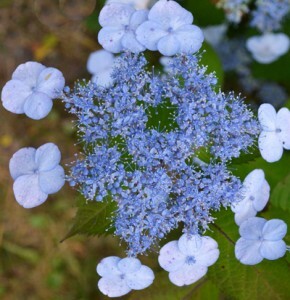 They were surprised to hear that its name is ‘Lady in Red.’ This lacecap hydrangea is in fact supposed to be red, Kenneth explained, but the level of aluminum sulfate in his soil turns it blue. 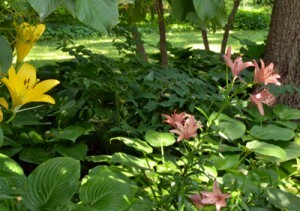 Also getting a great deal of attention were the colorful day lilies planted in deep shade. Kenneth explained that they were bred for shade. The Kurbses have some unusual animals, too. The Chinese golden pheasants were allowed to roam the property during Lockport in Bloom. Lucky visitors on Saturday spotted the spectacularly colored birds, but the birds were more shy on Sunday. 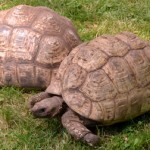 Fortunately, the two African leopard tortoises, who are surprisingly quick, were available for photos. Kenneth gave away about 70 plants to visitors during the walk. 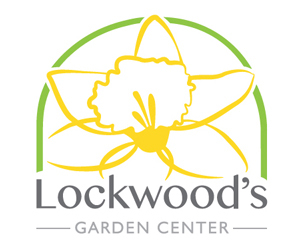 I was there and they have a great garden — and great BIG garden. Many thinks to them for opening it up for the tour. I should have taken that cactus on the free plant table! Thanks so much for the great coverage of my gardens. I’m so humbled by the awesome response. Jim from ArtofGardening.org I’ll be happy to share some more of my cactus if you’d like. Sorry you missed it when you were here. Over 70 plants flew out of here in a very short time. Thanks to all that came.